Performance appraisals happen to be one of the most dreaded and horrific responsibilities assigned to any manager in any company. Those who have done this before know what exactly we are talking about. Appraisals are actually quite worse when you compare it with terminations. Once you have fired someone, they will leave your office but when you give someone a negative review, they will still be around you looking and staring at your face. This is one of the reasons why so many managers avoid reviews. But if you are here to know about performance appraisals, we can help you. In this article we are going to discuss the process of performance appraisal with its meaning, objectives and advantages. Continue reading the post to find out everything. Performance appraisal definition can be described as a systematic evaluation of performances of several employees so that they can understand all abilities of a person and their development and growth. Performance appraisal is also done in a very systematic manner which includes measuring the pay of employees and comparing it with all plans and targets, analyzing the factors needed behind the performance of work and what employers are expected for a better performance and for their guidance. 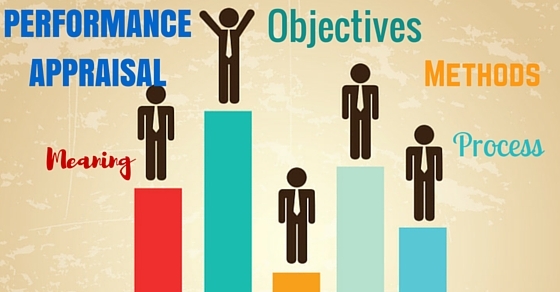 The following mentioned are few performance appraisal objectives. Some of the basic objectives of performance appraisals include maintenance of records so that all packages of compensation, wage structures, salaries and raises have been determined, seeking and identifying the weaknesses and strengths of all employees for better development and growth, providing essential feedback towards employees concerning performance and related statutes. Not only that, it helps in influencing the work habits of other employees and can also retain the training programmes of others. One of the most valuable goals of all performance appraisals is to reach the goals of the company. There could be metrics which are established on the basis of performance or even a percentage which increases the revenue dollars. Evaluation of performances must be timed by the manager so that they can discuss matters of professional development and be able to come up with goals that are strategic and may be used for measuring development. Both the manager and the employee must keep working together on the lines of success so that they can improve relationships and make it more effective. Performance appraisal can help a lot when it comes to managers and their employees. Not only does it allow the supervisor to chalk out all programmes of promotion but also makes a lot of work easy for them. In that way, those who don’t work hard enough or are inefficient are dismissed or demoted. A second thing that performance appraisal helps in is called compensations. Seniors can chalk out the packages for their employees in that way. Merit rating is always possible throughout the appraisal of performance. Several packages of compensation which include high rates of salary, extra benefits bonus, allowances which are very much dependent on the appraisal of performance. The criteria must also be merit instead of seniority. The procedure is also helpful when it comes to the development of employees. It helps them to frame the policies of training and several other programmes alongside. Not just that, it also helps them analyze their weaknesses and strengths so that all new jobs are given to those who perfectly fit in. It may also allow them to frame the development programmes in the future. Performance appraisal also allows all managers and supervisors to understand what the selection procedure is all about and who deserves a promotion and validity and who doesn’t. The supervisors at this point understand their workers and colleagues in a much better way. Future changes made in the methods of selection can be made in such regards. For all organizations, effective methods of communication between all employees and employers are needed. Though appraisal of performance is needed, the communication must be sought in several ways such as using the help of performance appraisal where the employers are able to understand the skills and accept them. Second is helping in the maintenance of cordial relationships with other workers, developing team spirit and helping other employees get better. Apart from this, effective communication is also needed. Appraisal of performance can be used as a tool for inspiration and motivation. Through the process of evaluation of the employees, the efficiency of the person can be determined once all targets have been reached. This could motivate a person quite well and also help them improve their jobs in the upcoming years. There are plenty of methods you can try for appraisal of performance. Some of the best performance appraisal and its methods have been discussed here. In the method of grading, some of the categories have been made in advance and must be defined in a careful manner. Three categories can exist in total. They should be named as outstanding, unsatisfactory and satisfactory. There could be several more columns for the grades if you want it that way. The performance of the employees has often been compared with the definition of grades. The employee then has to be allocated which describes them the best in terms of performance. Such type of grading can be done in the method of semester especially when it comes to the selection of candidates in the public service sector. The only negativity about this method is that all employees could be placed on the better side in terms of performance. The method of forced choice came into existence years ago and is being practiced till today. It comes with a bunch of statements and the rater is expected to show how effectively every statement will describe every individual and how it must be evaluated. Common methods or choice methods come with two statements which could be negative or positive. A few examples of the positive statement include giving proper and clear instructions, can be relied on whenever a task has been assigned. Negative statements make such promises which are beyond his limit, favors some of the employees. This is another traditional method you can try for measuring appraisals of your employees today. You must utilize the method of check listing so that the burden of evaluation is eased. In this method, statements and questions which come with answers such as no or yes must be prepared by human resource department members. The check list must then be given to the one who is rating so that they can tick the box that is correct. All questions are important and must be answered very carefully. This method will evaluate the performance of the employee from the benefits that have been yielded by the organization. This has to be ascertained by simply establishing a relationship between costs which are involved in helping the employee as well as the benefits which an organization derives. When you are evaluating the performance of the employee by using this method, you must take a few points down. They include quality of the products that have been produced and the service which has been rendered, the human relationship they share with others, the cost of time every supervisor spends in appraising their employees, damages, spoilage, errors, accidents etc. Here are six steps which are required during the process of performance appraisal. Every step is crucial to read all of them thoroughly before making any important changes in your regular methods. The process of appraisal starts when the standards of performance have been established. The senior managers have to determine what kind outputs, accomplishments, and skills need to evaluate. All of these standards must be evolved out of job descriptions and analysis. The standard of performance should always be concise and clear so that the objective can be measured and understood accordingly. Once the standards of performance have been built, you must remember to communicate the matter accordingly to all employees so that they may know what is expected out of them. The old experiences also show that not being able to communicate towards the employees so that they know what must be expected. Apart from that, it has also been stated that the standards of communication towards all employees will compound the problem of appraisal. However, it must be noted that transferring information from your manager towards the employees is not exactly communication. It could become communication only when transferring information has taken place and has been understood by all employees. The third step that must be taken during the process of appraisal is measuring of the actual performance. During this stage, the real performance of all employees is measured on the sort of information that is available from different kinds of resources, for example, oral reports, written reports, and even statistical reports. Personal observation also matters in matters like these. The feeling of the evaluator shall never influence the measurement of performance of the employees. Measurements have to be based on objectives, findings and facts stated. The reason behind this is that what we will measure becomes more important to the process of evaluation than how we are measuring it. During this stage, the real performance is always compared with standards that are predetermined. Such comparisons could reveal deviations between actual and standard performance and will also allow the evaluator that will proceed to the other steps of the entire process. In short, having a proper and detailed discussion with those who are concerned in the matter! Next what you must do in the process of appraisal is to communicate and discuss what the results of the appraisal are with the employees concerned. This happens to be quite a difficult and challenging task to accomplish for the manager who is expected to present an appraisal that is accurate for all employees and make them understand and accept their appraisal in a realistic manner. When you discuss matters like these with them, you are able to understand and assess their strengths and weaknesses in a much better way. It will also help them perform better in the near future. The impact could be either negative or positive depending on how it has been shown to the employees and discussed with them. The final and most important step in the process of appraisal is initiating the corrective action whenever it is needed. The areas which need any improvement must be identified and then the measures have to be improved and corrected so that the performance improves with time and has been identified at the same time. Corrective action again could be divided in two. The first one deals with symptoms mostly. It is called putting out fires. The second one is about what causes such deviations and looks for adjustment of differences. With that, we would like to bring the post to a close. If you have liked reading the article, have found some benefit from it and have some important feedback to give us, do feel free to comment in the box below. Also if you have any questions or doubts you would like to clarify, let us know about some of it. We would love to help you with that. Always remember that the concept of performance appraisal is not easy but you can definitely work on a few things and make it better. On that note, good luck!